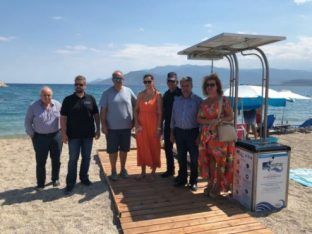 Aiming to make the beach of Astros, in northeastern Peloponnese, accessible to all, regional and local authorities recently installed a special mobility ramp to facilitate people with physical disabilities to move in and out of the water. 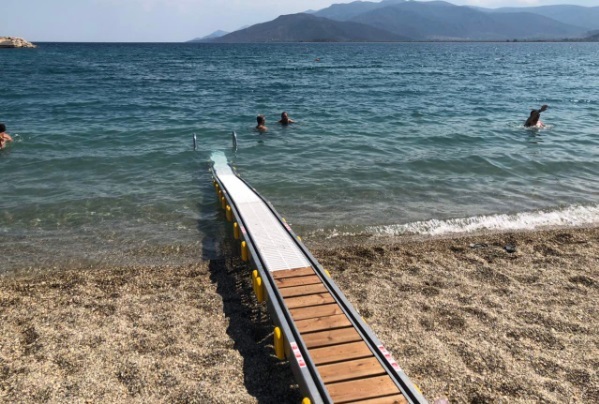 The special mobility ramp includes rails with an attached seat that enables people with disabilities to enter the water without the help of escorts. The special ramp was installed by the Region of the Peloponnese in collaboration with the association of people with disabilities of Astros, the North Kynouria Municipality and other local bodies. “It gives us a great pleasure to see that our social policy is actually improving the quality of life of our fellow citizens,” Peloponnese Governor Petros Tatoulis said. According to an announcement, three additional special mobility ramps will be installed at beaches across the Astros coastline in the future.